In 1976, there were two craft breweries in America. Today, that number is closer to 1,600. This phenomenon has been dubbed “The American Craft Brewing Renaissance.” The sudden revival in Americans’ taste for well-crafted beer created a sizeable market for brew pubs, micro breweries, and amateur home brewing equipment. According to brewersassociation.org, 1,595 craft breweries operated for some or all of 2009 – at its highest since Prohibition. 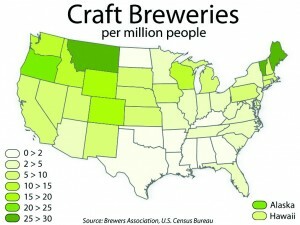 The craft brewing market takes about a 4 percent piece of the pie by volume and about 7 percent in dollars. Not bad considering the immensity of the industry. Beer is, after all, the third most consumed beverage in the world after water and tea. “Craft” beer is not always what it seems. Fans of Blue Moon might be disappointed to learn that it is owned by Molson-Coors Brewing Co. The label tries to hide that. Blue Moon is not alone. Many Craft breweries such as Red Hook have been bought up by Macro breweries. It’s a nasty shelf space war being waged by big brewing business, but it keeps phenomenal craft brewers in the game as rare, but revered artisans. As for home brewers: They are a strange breed of geeks who have taken the art into their garages and basements. They fabricate their own equipment out of Igloo water coolers and propane turkey fryers. The outcome is nonetheless fantastic. If researched and executed properly, a five gallon batch of home brew can beat anything on tap at an average local pub. The American Craft Brewing Renaissance has brought new life to the American beer palate. It has taught many to look beyond the strategically stocked liquor store shelves. All it takes to find outstanding hand crafted local beer is a Google search and a willingness to refine your palate. Check out next week’s article to learn about the home brewing process and find out where it’s being brewed on the Fairfield University campus.